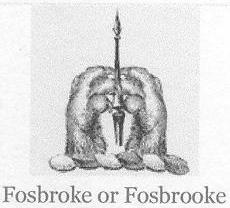 In 1998 I thought that the Arms of Fosbery were the same as those of Fosbrooke. 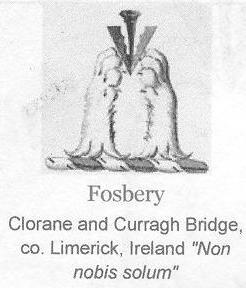 No place of origin had then been found for the first Fosbery who settled in Ireland. Francis of Kilcooly being the first name in the Irish Fosbery Tree, and he was reportedly a Dragoon Officer with King William's forces in the 1690's. This opened up an interesting line of research, for strangely enough one branch of the English Fosbroke family had a third son Francis born in 1601.This was only the second and final occurrence of that forename in the Fosbroke family records perused. This forename is however a common name in the Fosbery family in records from mid 1600's onwards. The records that I had perused had shown that on 30th April 1668 one Francis Fosbroke had married at Clanfield in Hampshire. The maiden name of his wife was not given, but he is the only Fosbroke found in those records in the South of England. I thought that there could have been a primary connection there. Thinking for example that this third son (Fosbroke) went to Ireland and there adopted, or perhaps there occurred, a change in style of his name - spellings were often found to be varied in former times even within the same family, sometimes even within the same document - certainly between different regions. If he had been set up as the head of a 'new' branch of the Family, now having Estates - procured from the Irish Proprietors - could he not have retained the customary arms of his family even if restyling his name, perhaps alluding to an older spelling and relating to the Wiltshire Fosbury? 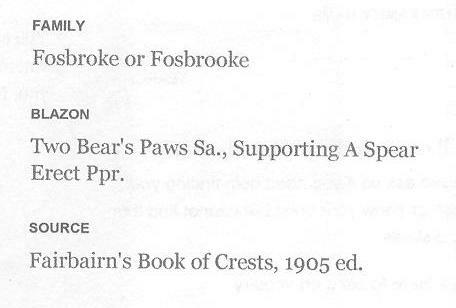 The first record of the spelling Fosbroke, occurs 300 years after the Domesday records. Both are listed in the Domesday Book and are now identified as FOSBURY in Tidcombe, Wiltshire. 1244 John de FORSTBURY Listed in Wiltshire as a Forester. Also spelled John de FORESTESBI in some documents. 1391 John FOSSEBROKE Held lands in Cranford, Northampton. 1528 Henry FOSBROKE 4th son of Edward (Gerrard) settled at Nottingham. 1564 FOSBROKE Family recorded Arms and Pedigree at the Herald's Visitation of Northamptonshire in that year. 1593 Francis FOSBROKE of Nottingham, 3rd son of Henry, died. 1640 Francis FOSBERY of Kilcooly - Will dated 1700. His origins are not yet known, but he is listed as, 'of a Family anciently of Wiltshire' and which later became settled also in Hampshire and Berkshire. 1690 Francis FOSBERY of Clorane, son of Francis of Kilcooly, also said to have emigrated to Ireland. His Will is dated 1717. FOSSEBROKE does not occur in the present records until 300 years after the first FORSTBURY record. When, Where and Why did FOSBERY reach it's present spelling? Where - in England? - was Francis of Kilcooly born? His son, Francis - later of Clorane co. Limerick - is said to have emigrated to Ireland in 1690.
Who was in William III's Dragoons - Fosbery &/or Fosbroke ? 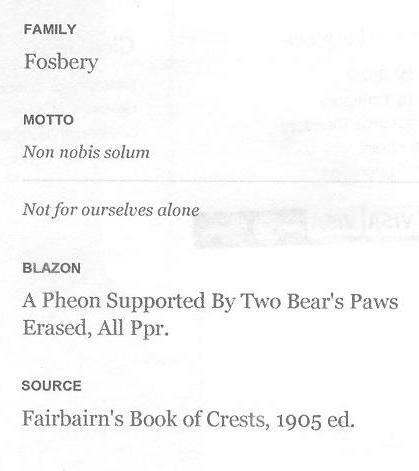 In 2013, further research showed that by the time of 'Fairbairn's Book of Crests', first published in 1859, the situation therein had been clarified. These records put some distinction between the Fosbery and Fosbroke Families at least as far back as the mid-19th Century. Though there still may remain some historical association in the more distant past, that is the hypothesis of this article. Back in 1870 Lt Col. George Vincent Fosbery VC. son of Thomas Vincent Fosbery, sometime Vicar of Christ Church, Reading, Berks. Petitioned the Duke of Norfolk to be assigned his own Arms and was successful in that cause [see link].